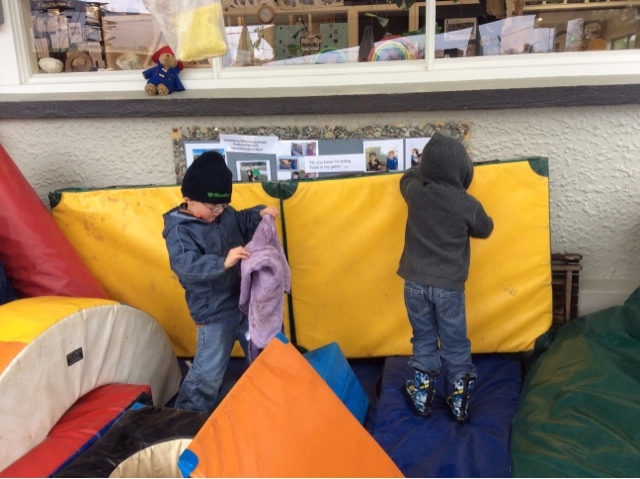 Today because it was wet and has been over the weekend, we decided to put out all the foam shapes under the verander for the children to use to use their large gross motor skills. 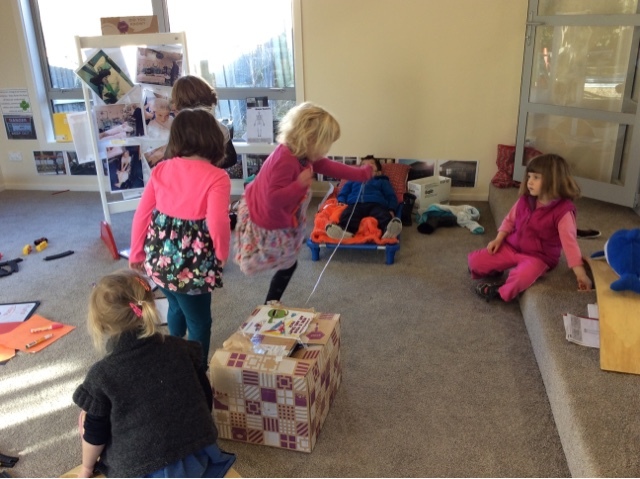 Childrenvshowed fantastic manaakitanga/ care and respect towards each other and the mats, cleaning them when they got wet so it wasnt so slippery. 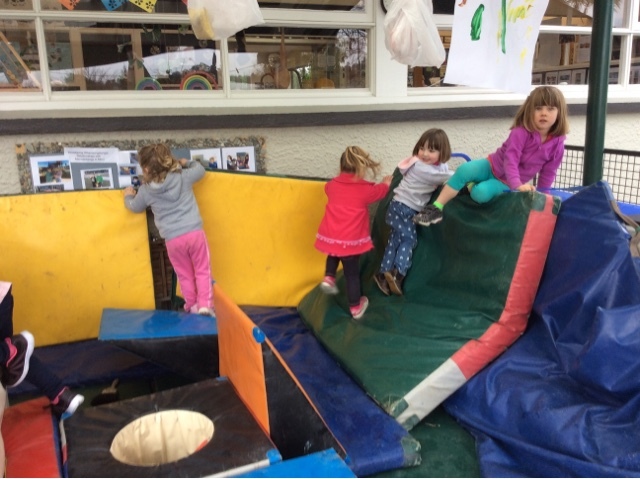 The children become very innovative and creative with their ideas in this space,some used it for jumping and climbing, others turned it into a castle and some made it into a slide. That’s good thinking, he pai koe ki te whakaaro pena. 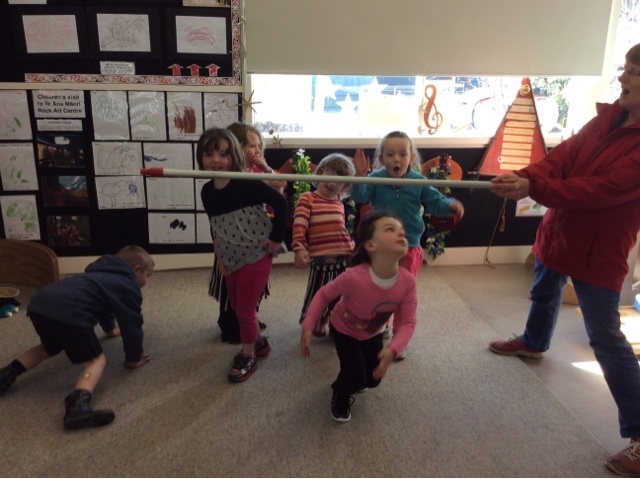 This morning some of the children were having fun exploring their dance moves so Liz decided to test their flexibility and introduce them to the limbo. 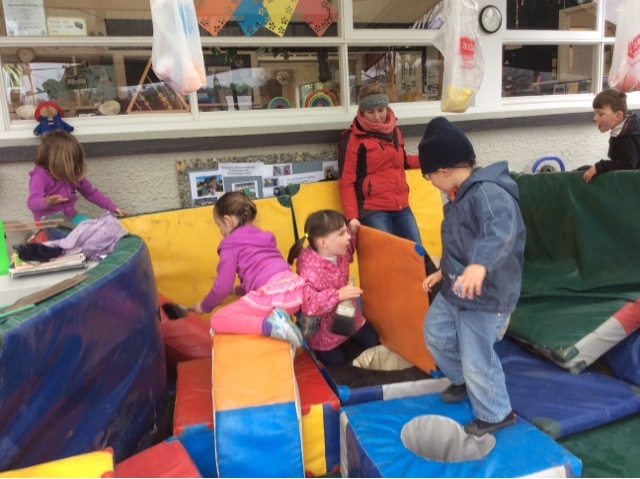 Trying out a new activity can be scary when you dont know quiet how it works so we encouraged the children to take a responsible risk and give it a go. As they become more confident they began cheering each other on and managing their impulsivity as they took turns. 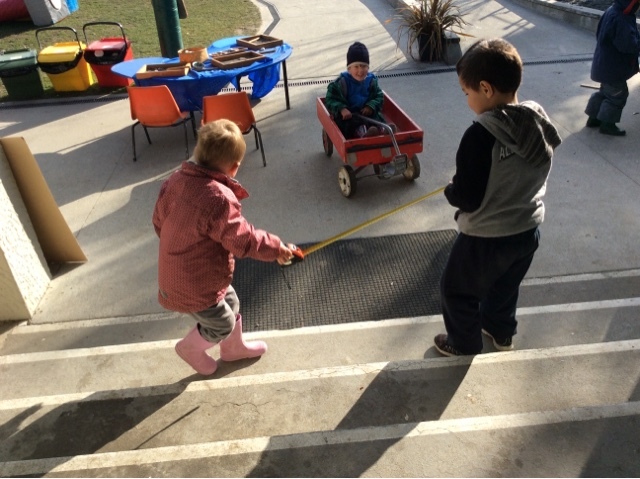 As the children watched each other try and get under the broom handle they began exploring their creativity as the handle got lower and lower to the ground. some explored trying different ways of moving their head to see if they would get under without falling over while others crawled along the ground. When things are difficult don’t give up, ka pakeke te haere kaua e hemo. Lots of fun was shared as we heard the children laughing and giggling when I suggested Liz give it a go. 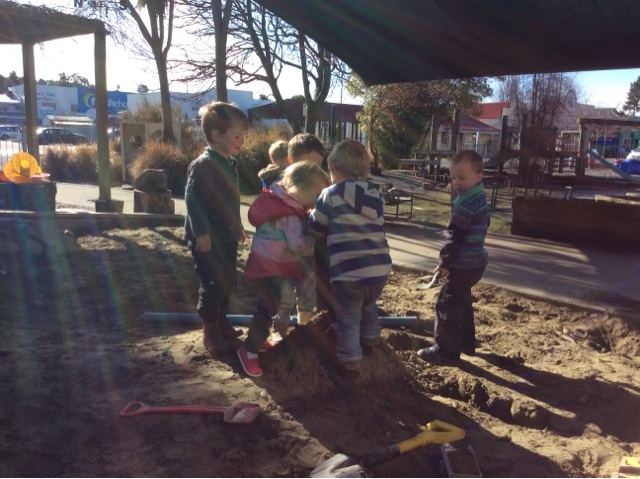 This afternoon the sandpit was a hive of activity as the children explored how to get the pipes sticking out of the ground without holding onto them. They perservered with difficulty as they tried pushing the pipes into the ground, but "uh oh" it fell over. 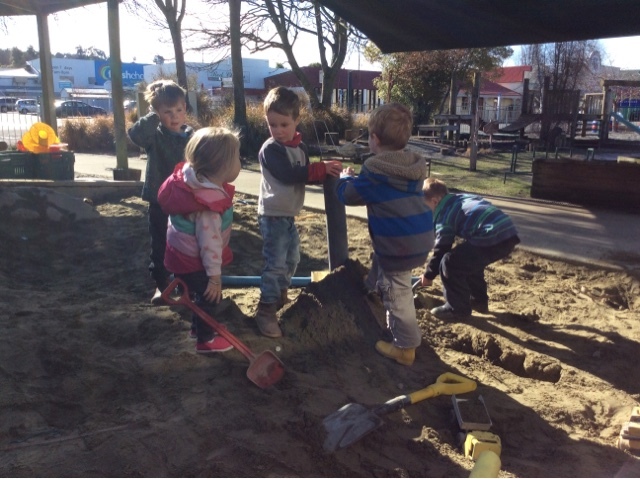 With some encouragement the children Mahi Tahi/ worked together putting the pipe into a hole and then tried mounding sand up around the pipe to hold it there. We were all very excited when we were successful and the pipe stayed in place. You have worked hard, kua mahi kaha. 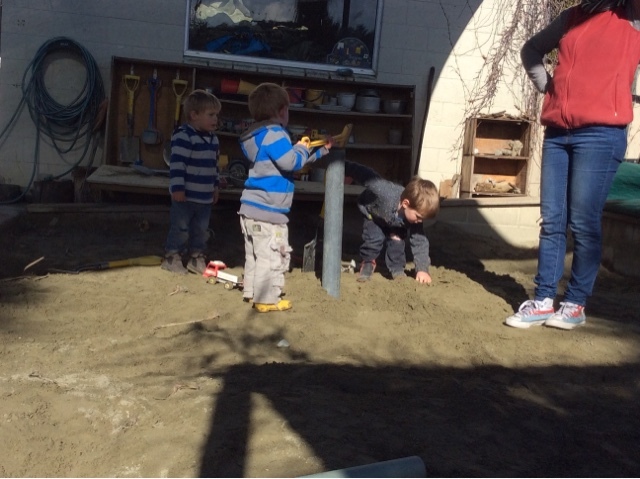 Once the excitement was heard more children joined the group to help place more pipes in the sandpit, but oh no there is a problem, a digger has been put down the pipe, so again the problem solving began. The children perservered trying to find ways of getting the digger out. 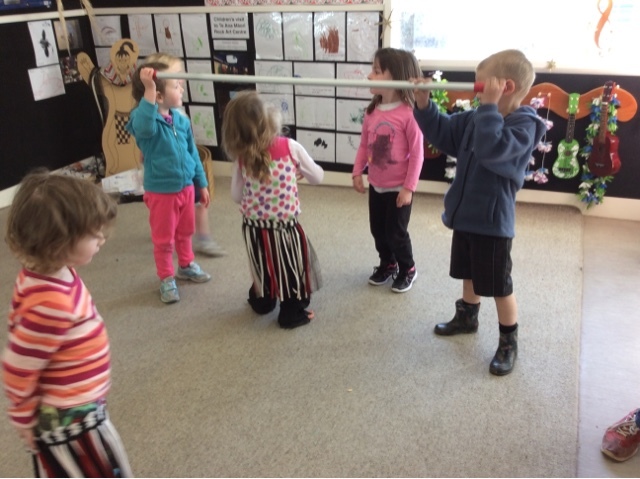 They tried one by one putting their arm in the pipe to see if someone could reach, but no ones arm was long enough, then it was suggested that they could look down the pipe to see how far down the digger was "its to dark" shared some of the children. The problem solving continued for some time until the children realised the pipe could be pulled out of the sand and the digger would be waiting, this then became a chance for the children to use their humour as they anticipated when one of them would take the pipe out to expose the digger. 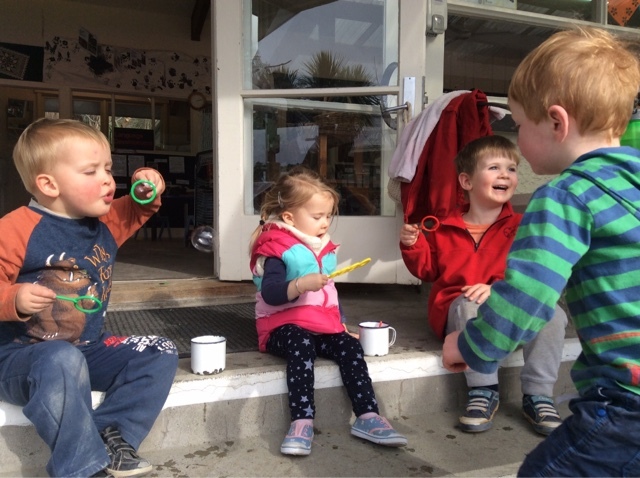 We work together for maximum impact, Ka mahi ngātahi mo te tukinga nui tonu. 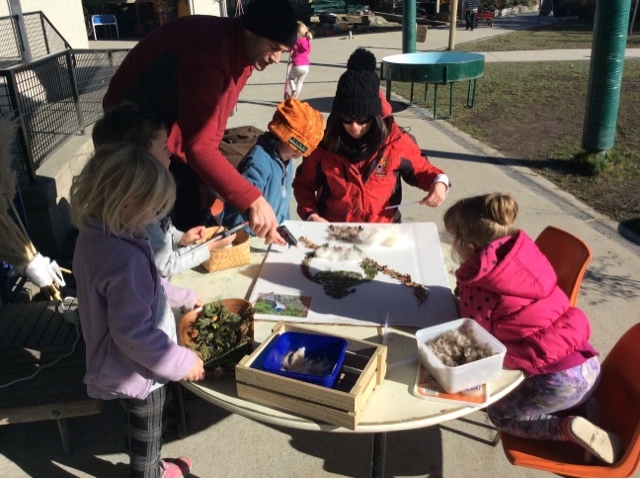 The change in weather over the weekend is certainly great motivation to start exploring planting again at kindergarten and this interest has certainly been reflected outside with the shift of our garden boxes. This morning we brought this inside and created "people" containers that were able to grow different styles of hair depending on the seeds we chose . All sorts of creative ideas emerged from the resources provided including creating an icecream with the mustard seeds as the icecream . 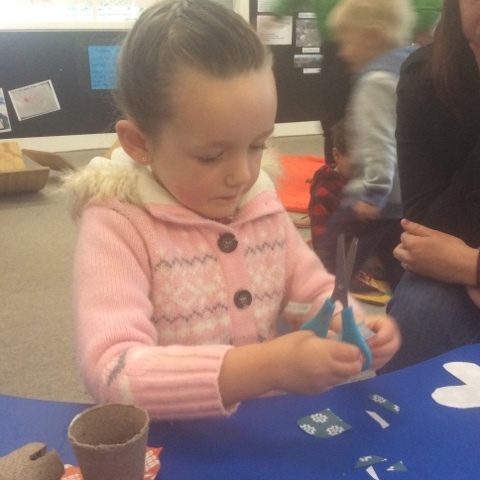 Fine motor skills were practiced over and over with the challenge of cutting through felt and attaching small pieces to the small containers that housed the seeds . 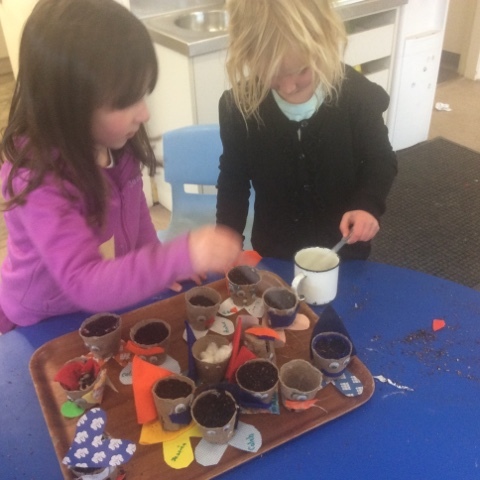 Children had to strive for accuracy ensuring that they were able to reflect the ideas they had in their head onto the small container they had to work with . This is very creative ,he tino auaha tēnei! This morning has been looked forward to for sometime by children in our morning session. 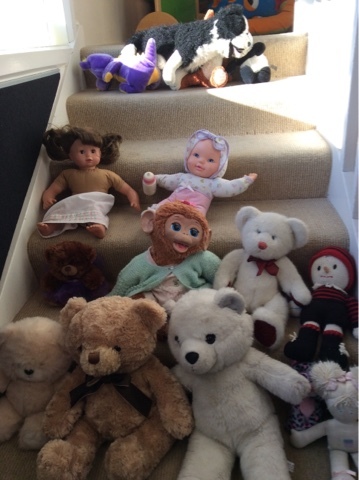 Earlier in the week a small group of children planned a doll and teddy day at kindergarten with Louise, this was to bring their special friends to kindergarten to spend the morning, show their friends and share some kai with. So this morning children arrived excited to bring their special companion to kindergarten for the morning. 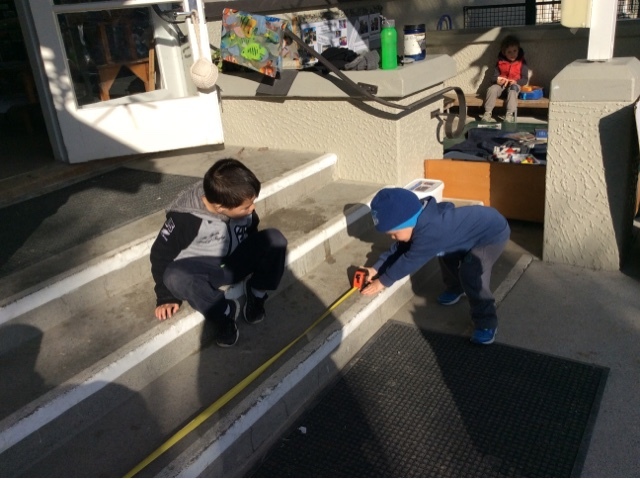 There was laughter heard around the kindergarten as children used humour to connect with one another, introducing their guests to one another before settling into play. It was time for kotahitanga (a group time where we come together each morning) and the children proudly lined their guests up on the steps while practising Kotahitanga - a Jump Jam song. The children's guests then joined us on the mat to start our morning together. 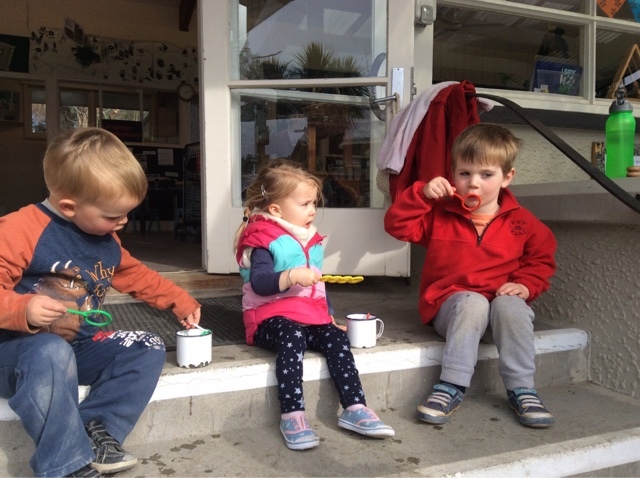 They sat with us on the mat to say our mihi and karakia before washing our hands (some children taking a cloth to wipe their bears paws) prior to having some fruit. A special morning for our children to bring something special to them from home and share it with their kindergarten family! 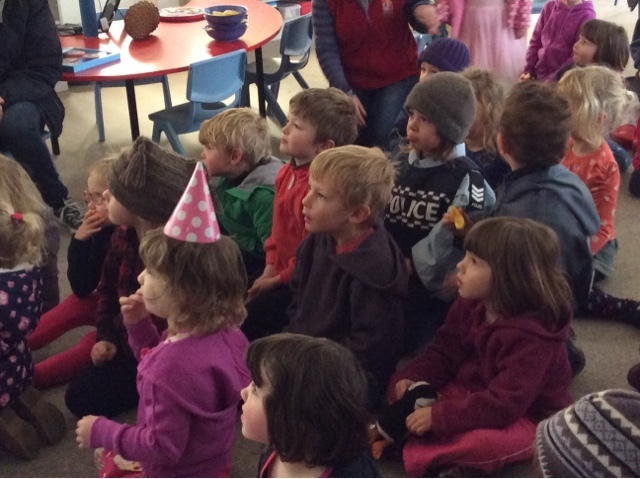 This morning we had a special visitor arrive at kindergarten asking to share a quick story with the children. 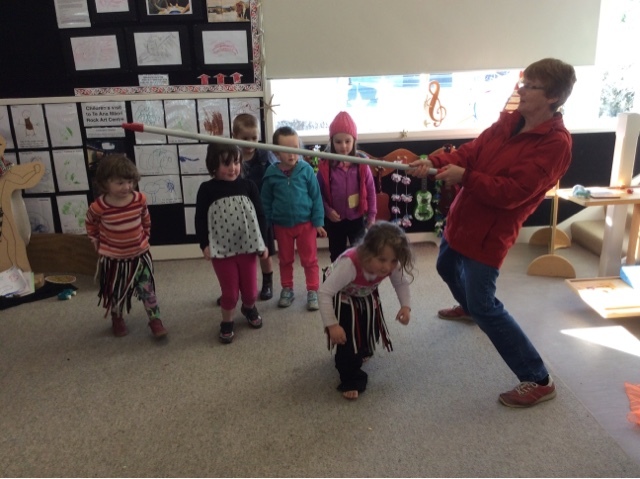 Liz Weir is a well known storyteller/puppeteer around New Zealand and grabbed the children's attention instantly. Liz brought with her Mitch the cheeky monkey who liked to make us all laugh "because you can't be sad when you laugh" he said. 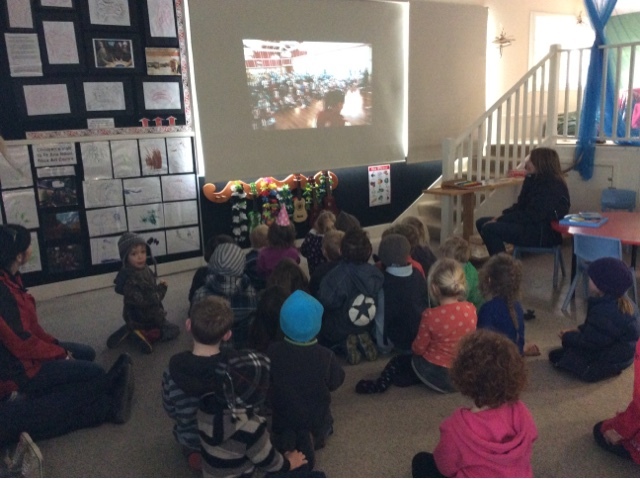 Children found humour together as they listened and watched with anticipation not knowing what was going to happen or be said next. 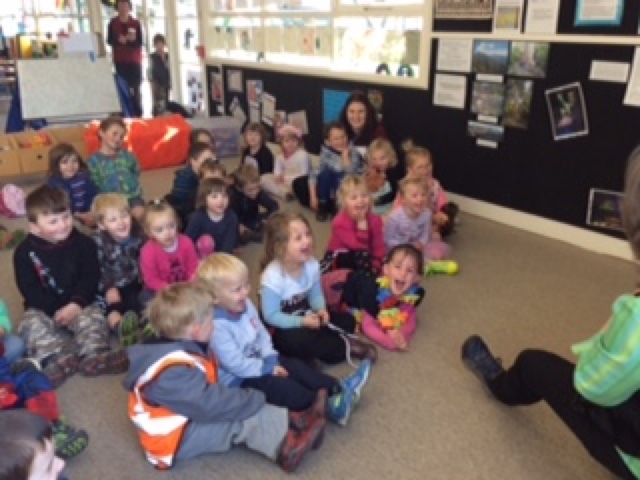 The humour that Liz used appealed to the children who were in hysterics as thye learn't more about Liz's monkey Mitch. 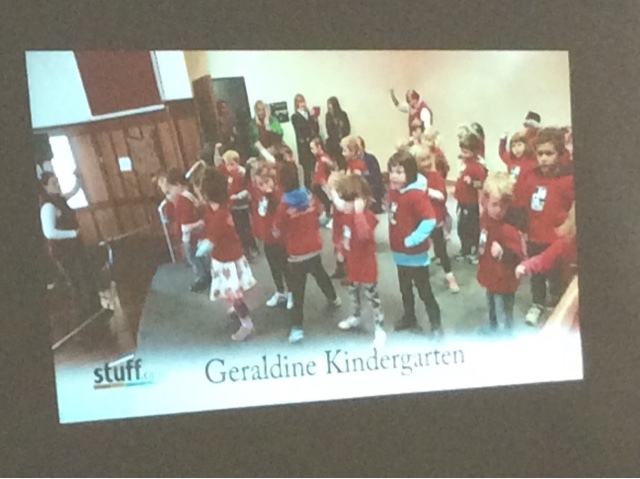 Liz commented on how excellent the children's listening skills were - a great example of the manaakitanga/care and respect that happens here, something we value here at Geraldine Kindergarten. 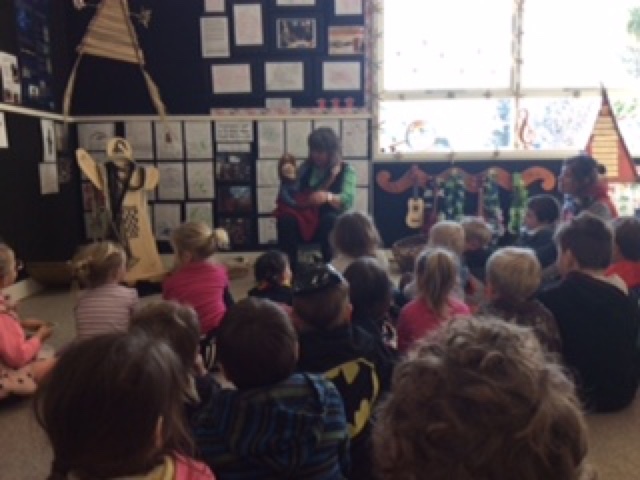 Kia Ora, thank you Liz for coming to visit us today. We look forward to seeing you in the future! 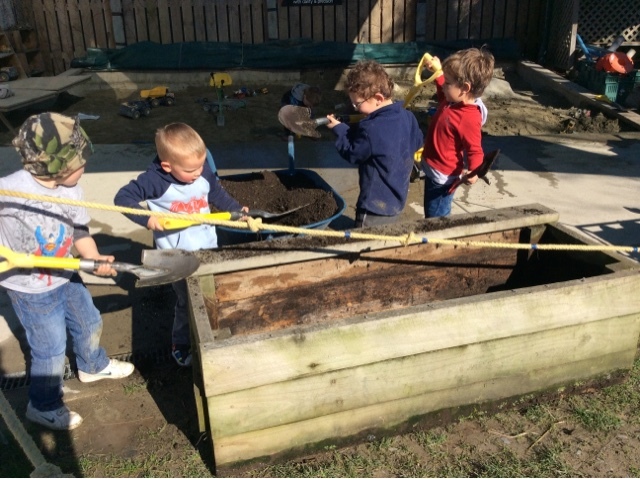 This morning mahi tahi/team work was key as children worked together to move our planter boxes. These planter beds were around the side of kindergarten, where Brownie and Silkie live and despite numerous attempts to keep our cheeky hens away from the vegetables that were growing they would still get eaten. 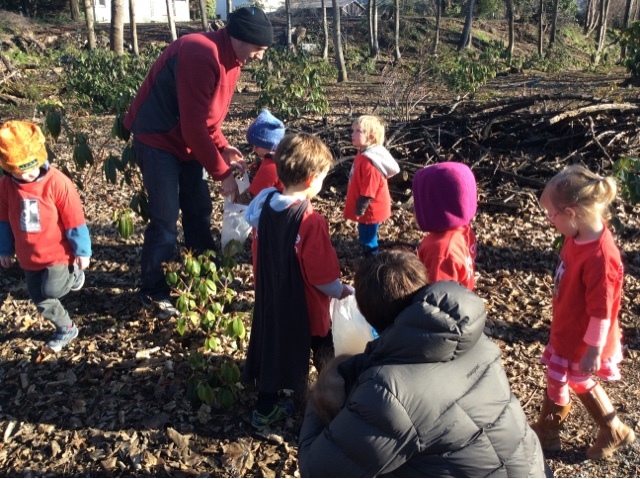 So today was the day that a lot of hard work and perseverance was needed to locate them to a new 'home' at kindergarten. 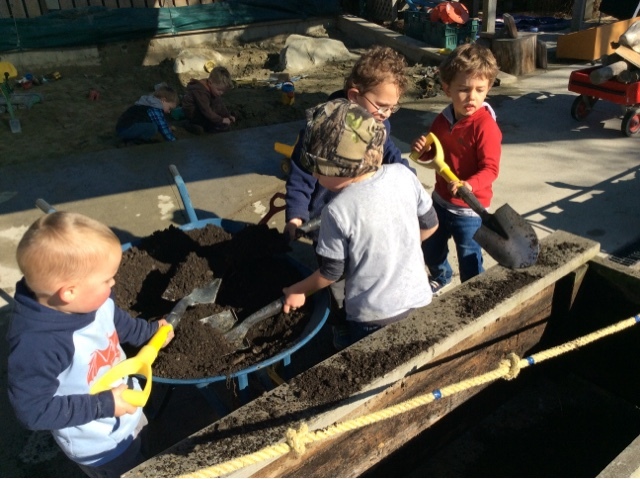 Initially the children dug soil out of the planter beds into our wheel barrow. 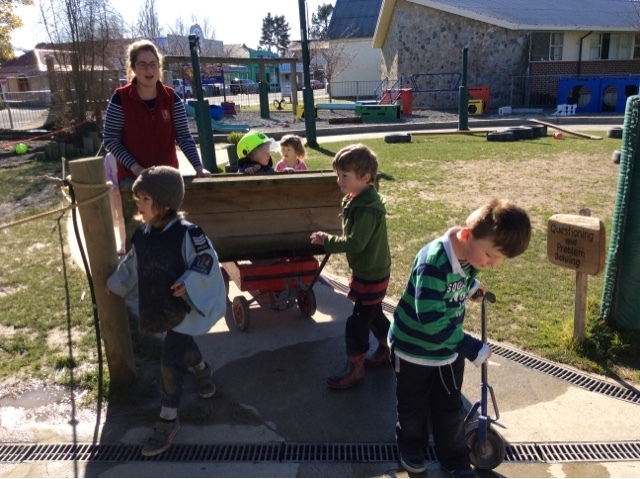 This meant that the planter box could be put onto a trolley, driven around kindergarten and put into place. 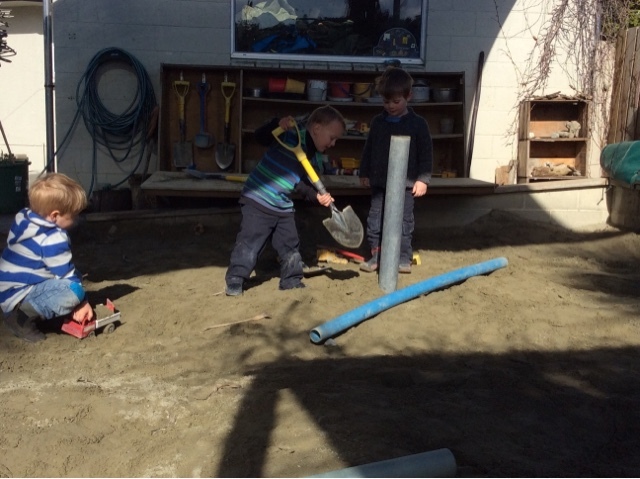 Shovels were collected from the sandpit and others joined in on the work to help move the soil from the wheel barrow into the planter box. 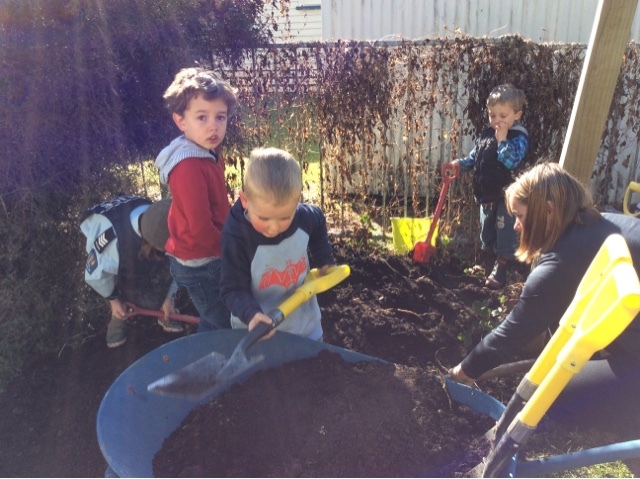 Kayne said "we have to work together aye" as he stood around the wheel barrow shovelling the soil out into the planter box with his friends. Others stayed at the old planter box site and continued to shovel soil into a trolley that was then unloaded into the boxes. As you can see by the photos there was a lot of interest and involvement in the real work that happened this morning. 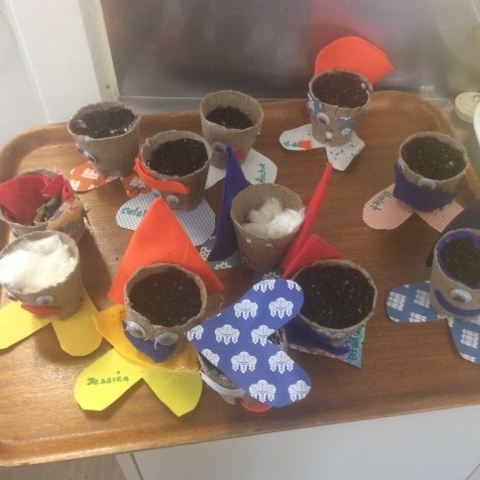 We cannot wait to share with you the progress as children continue to fill the planter boxes with soil and decide what to plant. Silkie appears to be quite knowing when food is about! Emma and Molly were having their morning tea and Silkie walked right up to them and a little wave of the hands to choo her away was ignored. In fact Silkie was quite cheeky as she ducked under the seat and waited for the little morsels of food came her way. 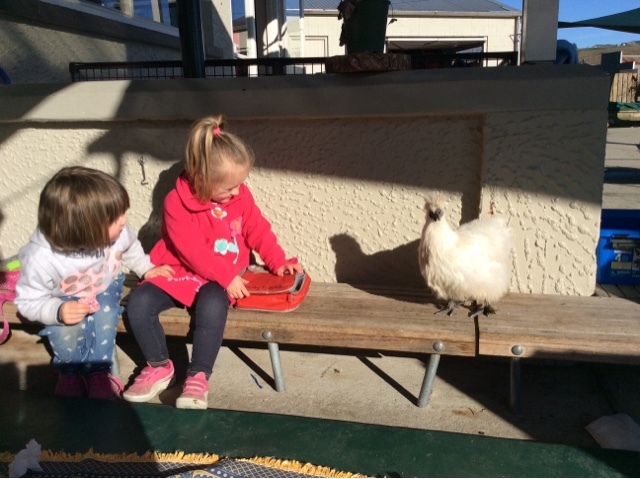 The girls squealed with delight when Silkie hopped up on the seat trying her luck further but found that everyone closed their lunch boxes, "SIlkie is not eating my food!" exclaimed Molly. 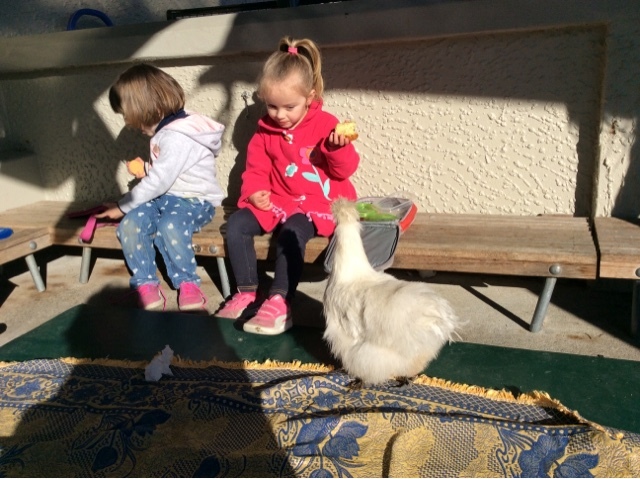 We have found that Silkie is quite persistance when she discovers food in the kindergarten. She has even visited inside much to everyone's wonderment and awe and she finds many ways to stick around like getting under the table! What a clever hen you are! 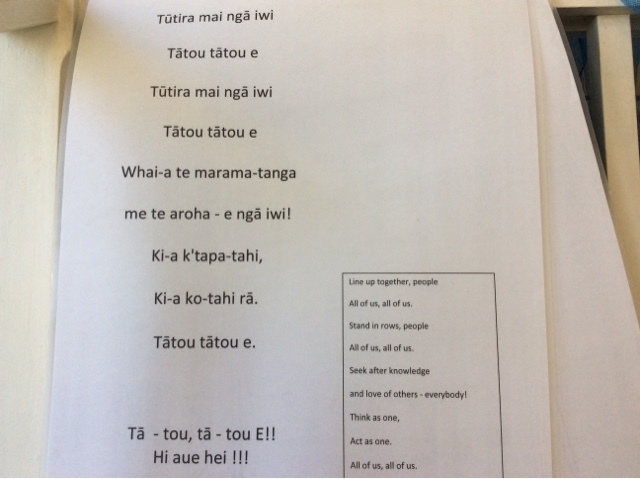 This week the children have been asking to listen to "Tūtira mai nga iwi." 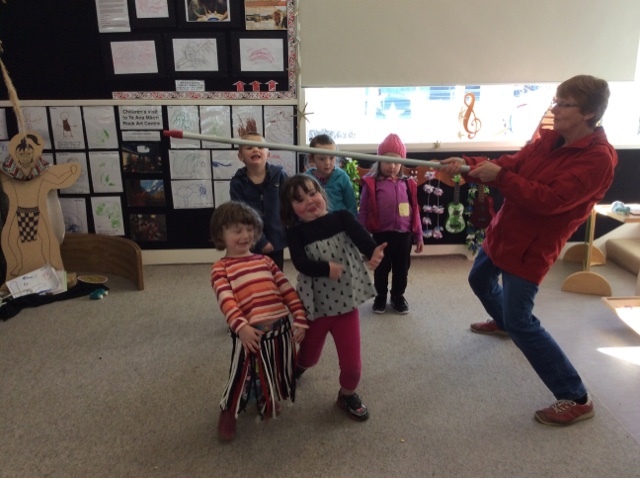 With great enthusiasm, they dressed up and began singing and dancing along. To ensure the children understand what they are singing about, we have explained the English translation to them. This gives meaning and purpose to their actions. 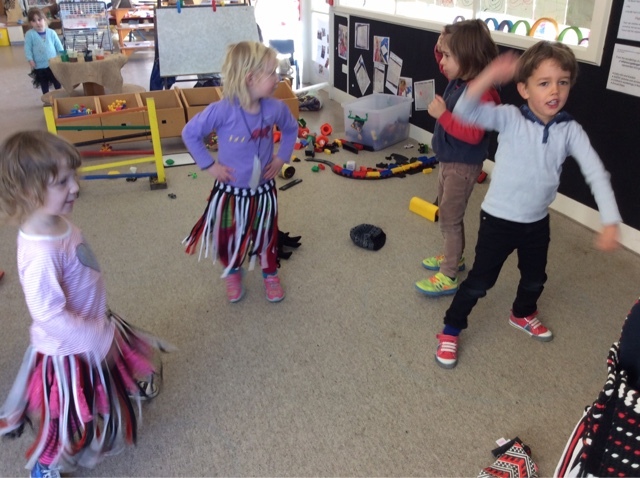 We practised standing in lines- tūtira mai nga iwi/ line up or stand in rows together people. 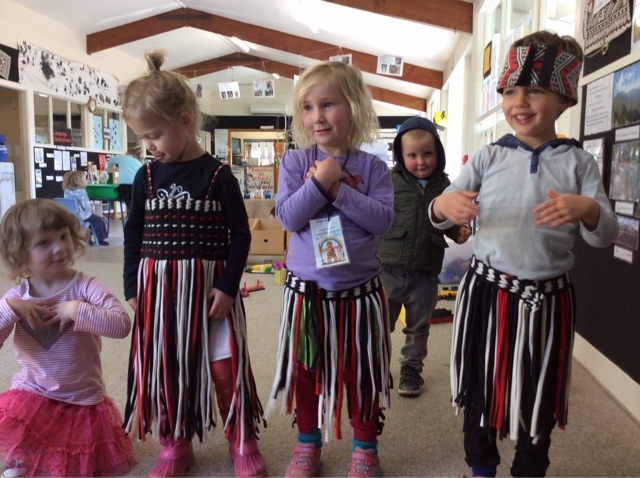 This song reflects ako/ reciprocal learning and manaakitanga/ care and respect which are two cultural competencies that we value highly at Kindergarten. Whai-a te marama-tanga me te aroha/seek after knowledge and love of others. Now we are looking at learning the actions to this song. Tino pai. Great stuff! 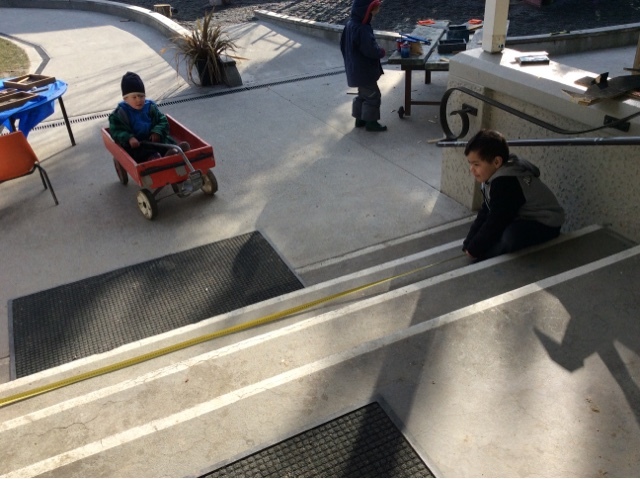 Wintrow pulled the tape measure as far as he could along the step and Ben anchoured the other end. Ben said to Wintrow, "You can let it go now!" The tape retracted along the step that created wonderment and awe for Wintrow and others as they each had a turn too. Ben was able to step back as they began to work together to make it their own game. 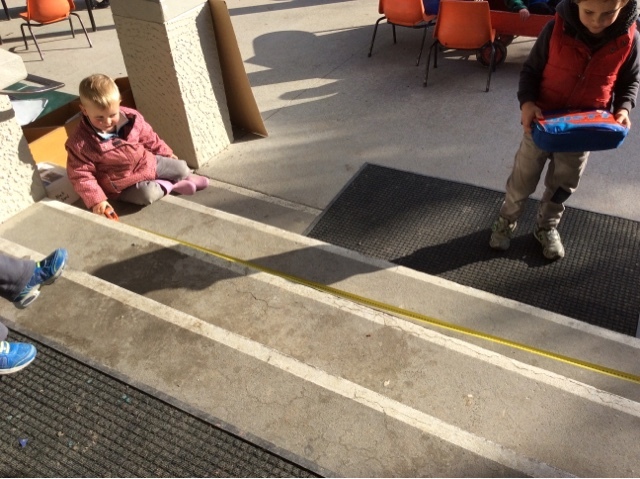 Their faces lit up each time the measure was stretched and placed on the step - striving for accuracy - and then let go! Ka pai to mahi tahi! Heather introduced a large card drawing of familiar birds we see in our environment. It was only last week that Ashleigh and I both spent some time with the children to watch a kererū/pigeon sit upon a high branch in the tree. We watched it as it moved its head around to look down on us and noticed the long claws that wrapped around the branch to enable it to sit tightly. The card drawing has enabled the children to draw upon what they know and be creative to make our own kererū manu/bird. To explore birds even further Heather took a walk today with a small group of children down to the river track to listen and observe some more and collect treasures from the floor of the track. 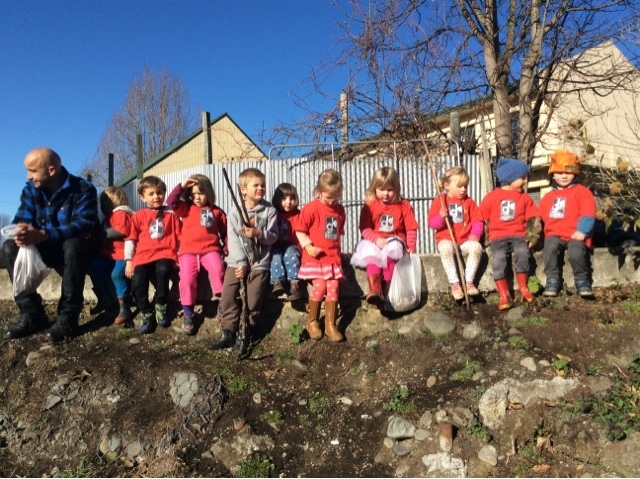 Kātahi te wakaaro pai - That's a good idea! With support from adults they could hear different sounds and build an awareness that each bird has its own sound. They saw lots of little brown birds far away and Heather suggested they could be wax eyes but recognised the sound of a bellbird. Could that be our next bird we can transfer to card and look for the colours that define our special manu in and around our community? 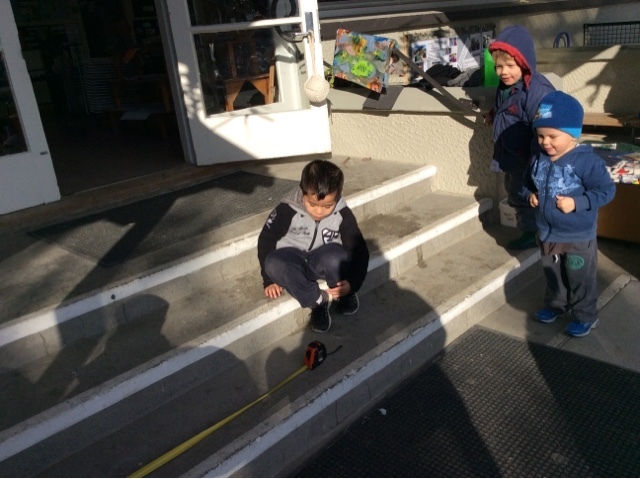 Bubble blowing has been a popular activity at kindergarten and the afternoon children are becoming experts. 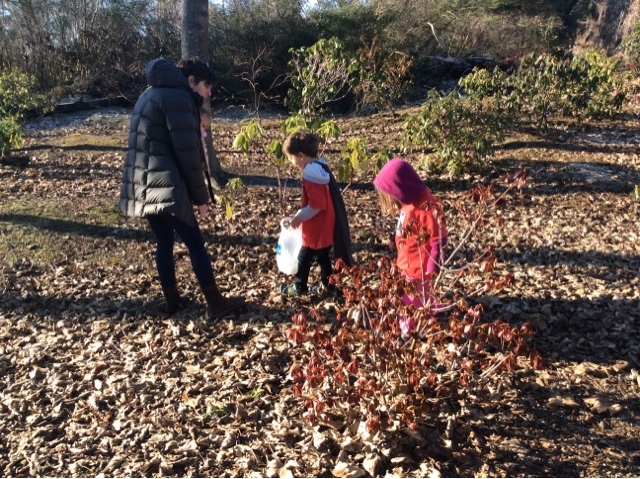 Such a simple activity encourages so many Habits of Mind. 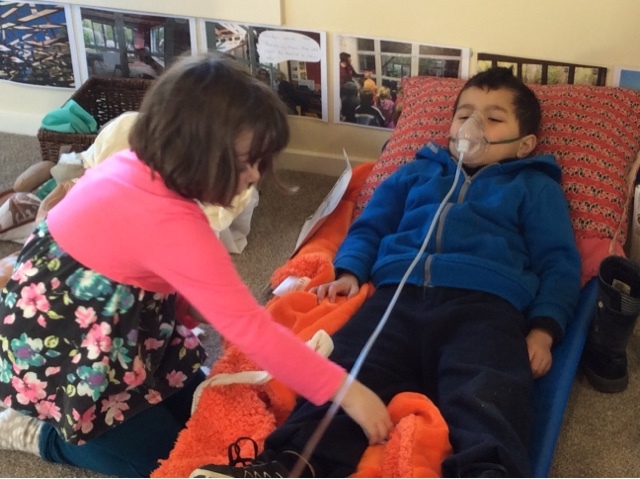 We see tamariki finding humour, which is an important life skill to have! Laughter brings us together and makes us feel good! Persisting with difficulty is another good habit to build. It can be tricky to figure out the right amount to blow to get a steady stream of bubbles, or just one big one. Perseverance and striving for accuracy is tested! When things are difficult, don’t give up. Ka pakeke te haere kaua e hemo. Managing impulsivity and turn taking are also some habits that can be practiced with bubble blowing. Waiting and trusting that we will get a turn with a bubble blower can be hard, but with reassurance, children can feel safe, knowing they will get a turn. 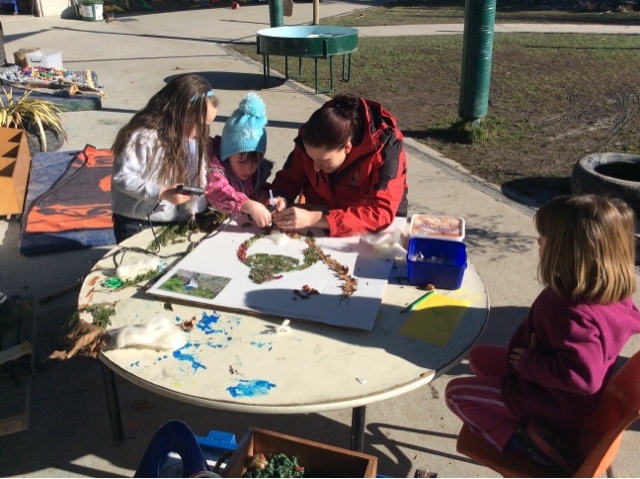 This is part of Manaakitanga, care and respect as we share the fun together. Our morning children have been showing a real interest in exploring the roles of surgeons and anaesthetists in our new room since it was ready to play in at the start of the term . 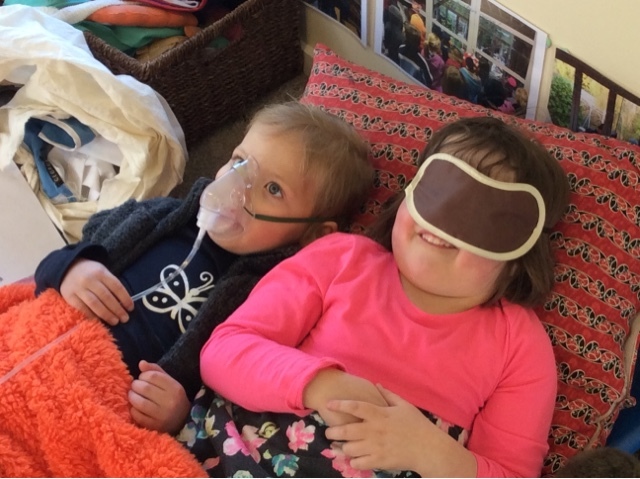 Yesterday we added large photos of Maddie's sister Alana going through the process of having a knee injury explored through X-ray, an MRI scan and then surgery . 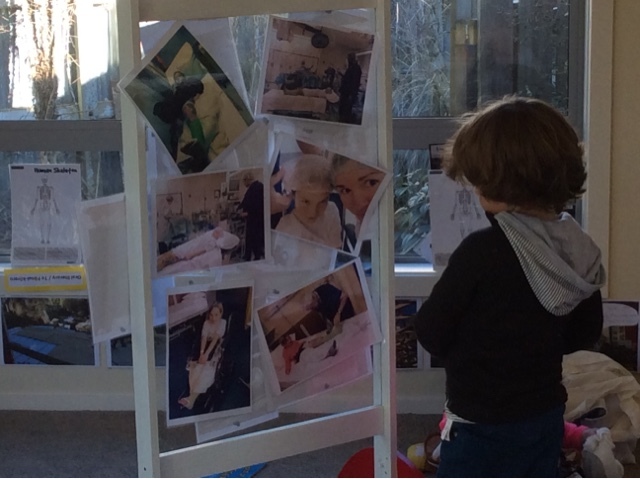 Tash ( Maddie's Mum) was very aware of the interest our children had been showing , so very thoughtfully gathered the photos of this real experience that Alana was going through to add complexity to the play. 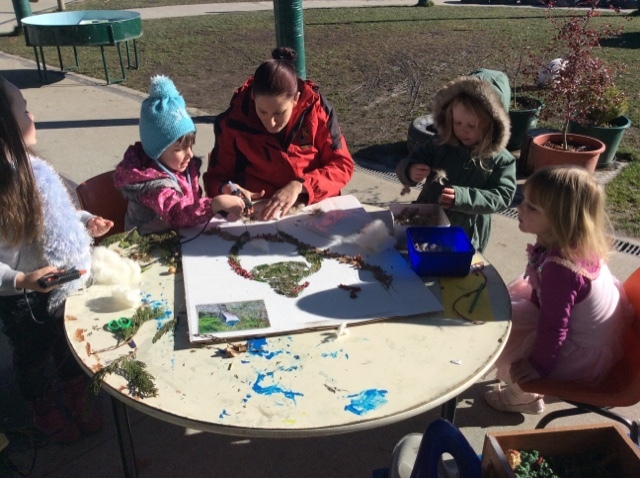 What an awesome provocation ! 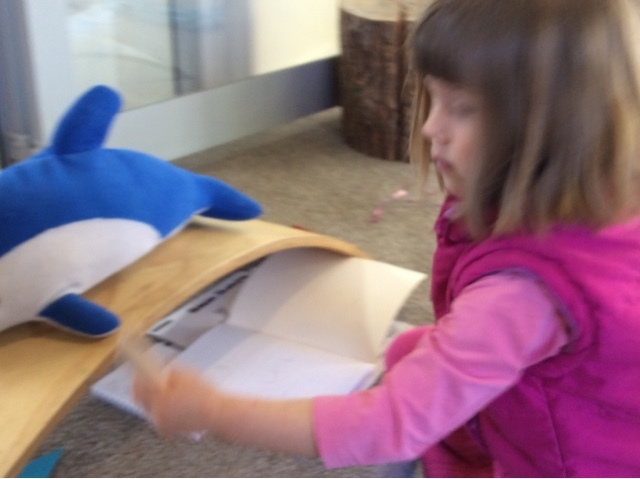 The children posed questions and transfered their own experiences to the one that Alana had been through . The photos were continually revisited as children carefully fine tuned their roles , striving for accuracy, trying to ensure they were offering the very best of care to their patients . What innovative and creative ideas ! We wonder what will follow tomorrow? What do you think?, he aha o whakaro? Wonderment and awe was truely reflected on their faces as they recalled what was clearly a significant event for them to be part of . The video was requested over and over until we gave the option of returning to play or watching the full videos that we had recorded . 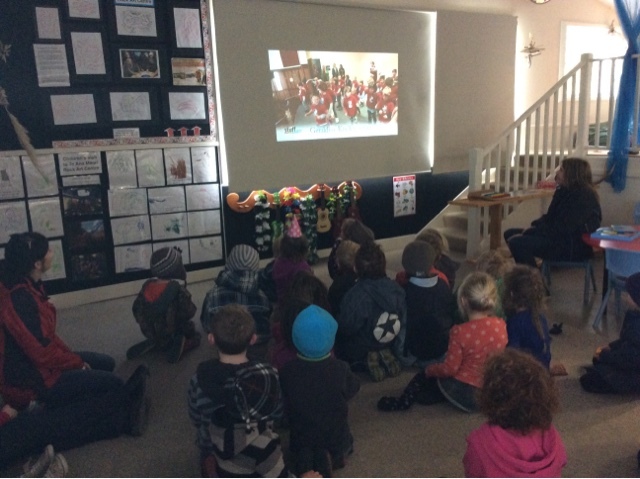 A number of children chose to get their morning tea and settled in to watch their creative dancing to our waiata . What a special experience to be part of and to revisit with our friends .